All new orders will ship on May 22, 2019. 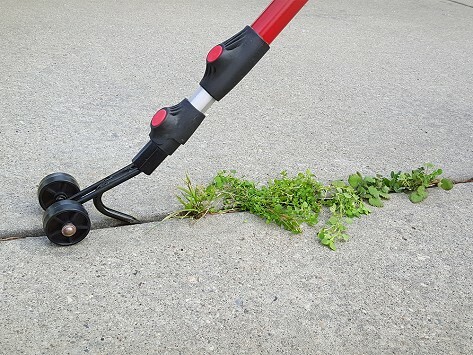 The Weed Snatcher eliminates using chemicals—as well as bending and kneeling on the ground—to get rid of weeds in cracks in places like the driveway, walkway, or patio. The tool's telescoping handle keeps you upright while wheels guide the sturdy metal weeding hook along. There are two interchangeable heads to tackle different areas, too. Dimensions: 45" x 4" x 4.5"
We have a very long driveway. This is going to make the job of weeding in between the cracks a simple matter! We are very pleased! I enjoy the look of it and it handle well. I don't need to bend down to get those weeds yeah! This is an amazing tool. It extends when needed and I don't have to bend over. I used it on my driveway and sidewalk and it did a great job. Ruppert Garden Tools Maker Jon Ruppert's mission is to better tackle common gardening problems in a simple and easy-to-use way. His weeding tool eliminates the need for chemicals to get rid of weeds in the cracks of the driveway, walkway, or patio. And there's no bending or kneeling on the ground here, either. The tool's telescoping handle keeps you upright while wheels guide the sturdy metal weeding hook along. Two interchangeable heads tackle different areas (sidewalk and driveway, and patio and deck), and you can swap them out while you're at work. This all adds up to a sturdy tool that makes quick work of a tedious task. Looks like Jon nailed it.